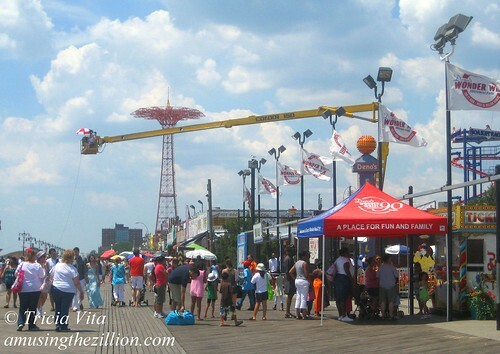 On a sunny Saturday in July, we noticed a photographer with a large format camera perched in a cherry picker above the Boardwalk at West 12th Street. The Coney Island Rumor Mill had no idea what the photo shoot was for, but it was an unusual sight and we snapped a few photos. Our first guess was that Google had sent someone to do panoramic photos of Coney Island, but as the hours went by it became clear he was shooting from a fixed perspective all day and into the night. Wilkes says that he photographs a scene continuously for up to 15 hours. “A select group of images are then digitally blended into one photograph, capturing the changing of time in a single frame.” In regard to the Coney Island photo, Wilkes told ATZ: “We will be launching a really cool time lapse video from that particular shoot, which will also be in the gallery exhibition.” The “Day to Night” series includes images of Times Square, the High Line and Central Park, among others, and will be on view at ClampArt Gallery in Chelsea from September 8 through October 29.
wow, that is amazing. love that photo, thanks for covering this Tricia. thanks, Barry. it’s def the first time that I took photos of a photographer without knowing who he was or what the shoot was for. Fun to find out via the web! This is AWESOME! I totally want to go check out the gallery to see this work up close and personal. Thanks so much for sharing.